stockholm by plenty: new timezones ? 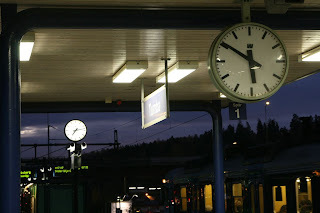 Yesterday I found that my trainstation suddenly is in the middle of two timezones? The line seems to be passing right between the two station-clocks. Rather confusing. Am I early to my train, or am I about to miss it? Daylight savings' time ends on Sunday, looks like a bit of local premature confusion. We have some more on the curvature of spacetime coming up.